After a couple of days in Bangkok, seeing only a very small portion of the 3,000 temples in the city, we decided to set out and explore the country side. 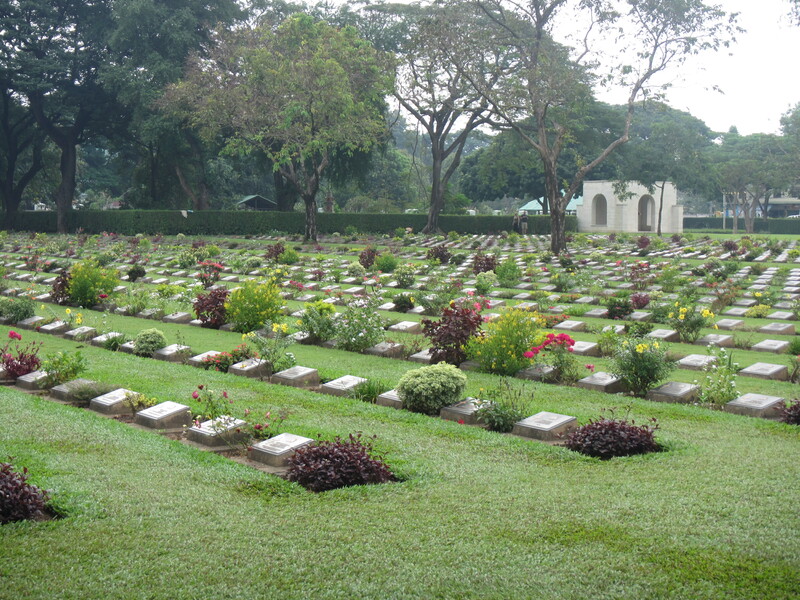 We joined a group tour and after two hours on a bus we reached the Kanchanburi War Graves where 7,000 Prisoners of War who sacrificed their lives building the Bridge over the River Kwai are buried. 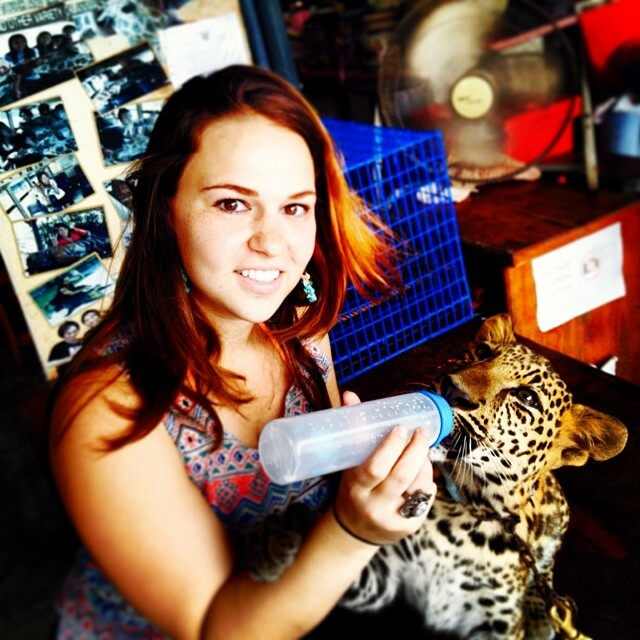 After walking around we reached the war museum where there were two baby leopards and I was able to bottle feed one of them. 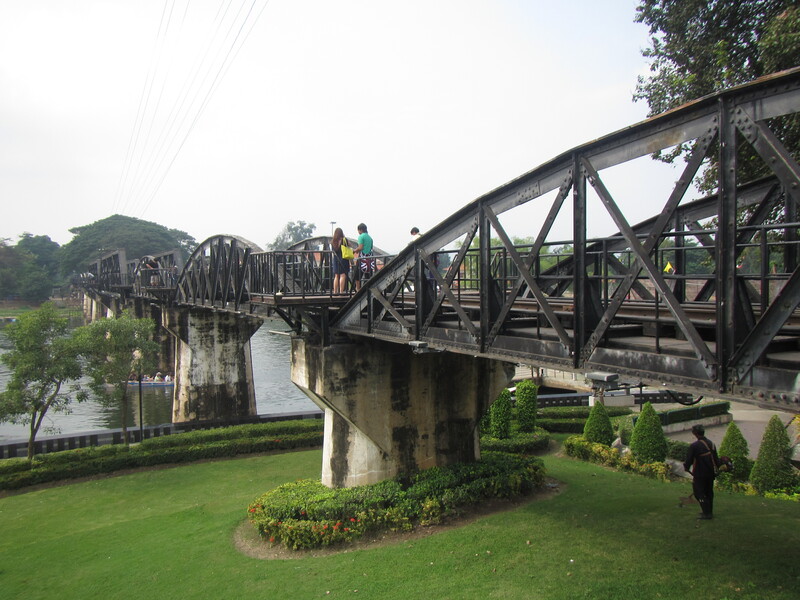 We then strolled along the Death Railway Bridge, the bridge over River Kwai which played a very important part in transporting cargo during World War II. To get the full rail experience we hopped on the train which took us through the country side, over rivers, through farms and along mountain sides until we reached a floating village. We had lunch on one of the floating houses, where we would be spending the night, and then shuffled onto a Bamboo raft. While we were on the raft it started down pouring but after a long day in the brutal heat Katie and I found the rain to be extremely relaxing. 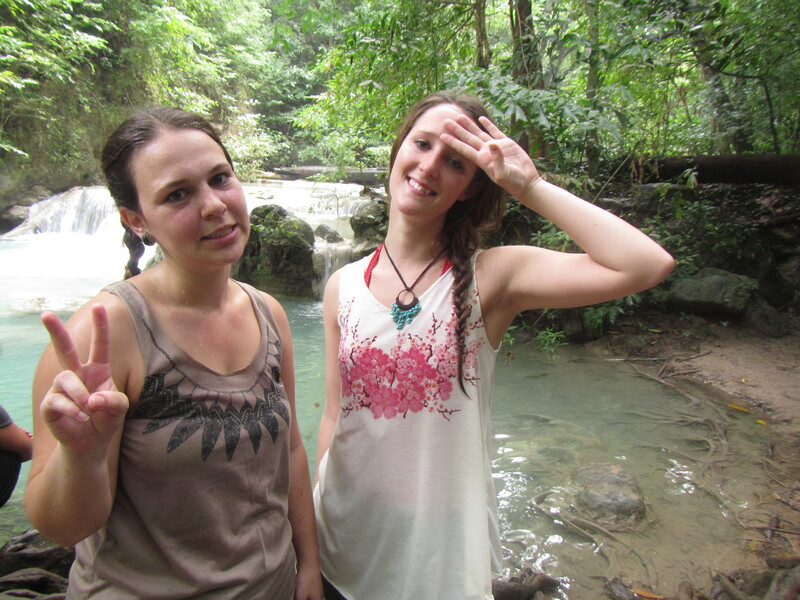 We floated downstream until we reached an elephant sanctuary. 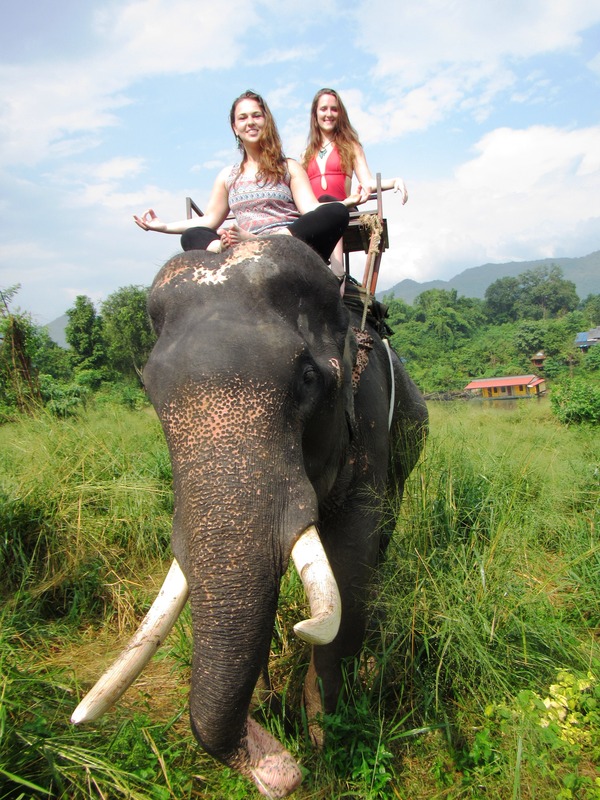 Katie and I climbed up the bamboo ladder and hopped on a beautiful male elephant. On the trek our elephant picked up an entire banana tree with its trunk and continued chomping on it for 20 minutes. There were eight or nine elephants on the land and they had so much space and looked so happy, the family who was taking care of the elephants was very kind and seemed to treat them well. While I was sitting on the elephants head I saw heard Gangnam style come on and noticed a baby elephant dancing to the song, it was hysterical! When the ride was over it was time to cool off in the Saiyoknoi Waterfall. 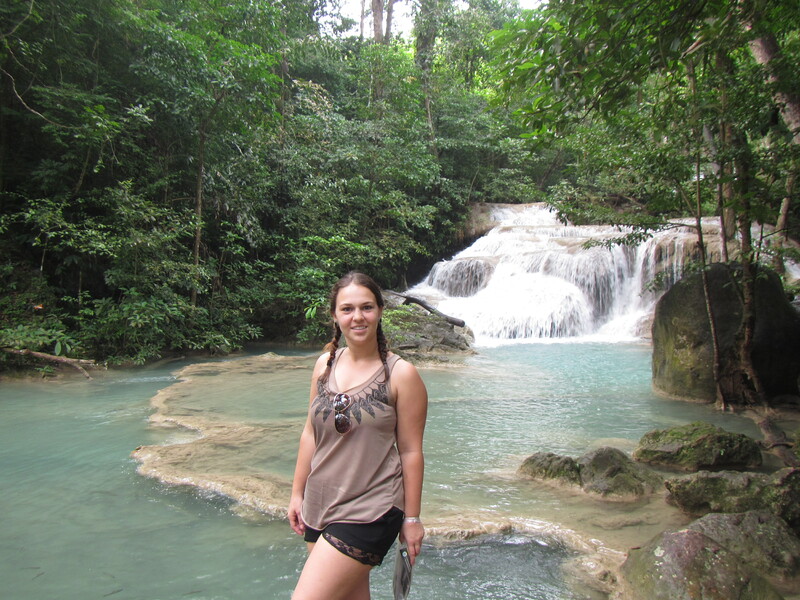 Katie and I had fun jumping up the waterfalls levels and exploring the caves. The falls eventually got the best of us and we made our way back to our floating home for dinner. After a full night of rest, I was woken up by rosters crowing at the crack of dawn, just in time to see the sunrise from our floating home. 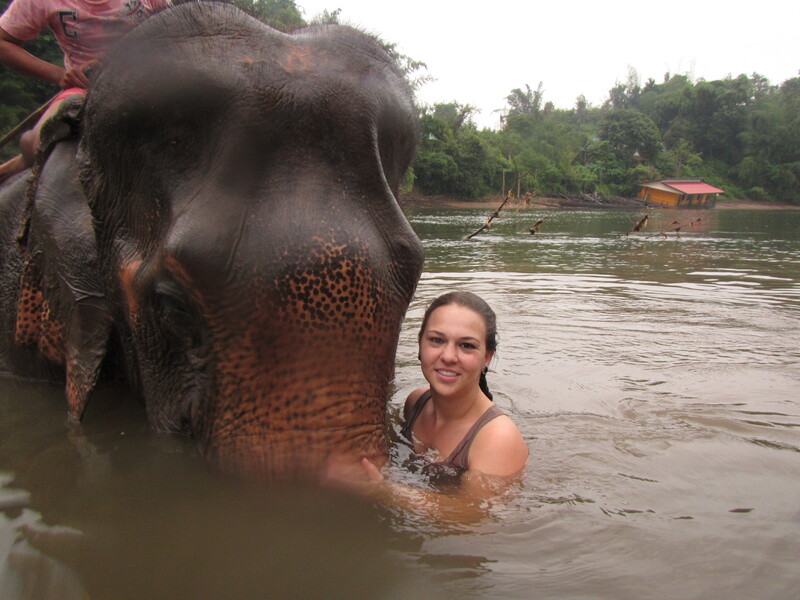 At 7am we made our way back to the Someuk Elephant farm and it was time to give them their baths! Katie and I were under the impression we would just be washing them, but boy were we wrong. Not only was this bath time, it was play time. 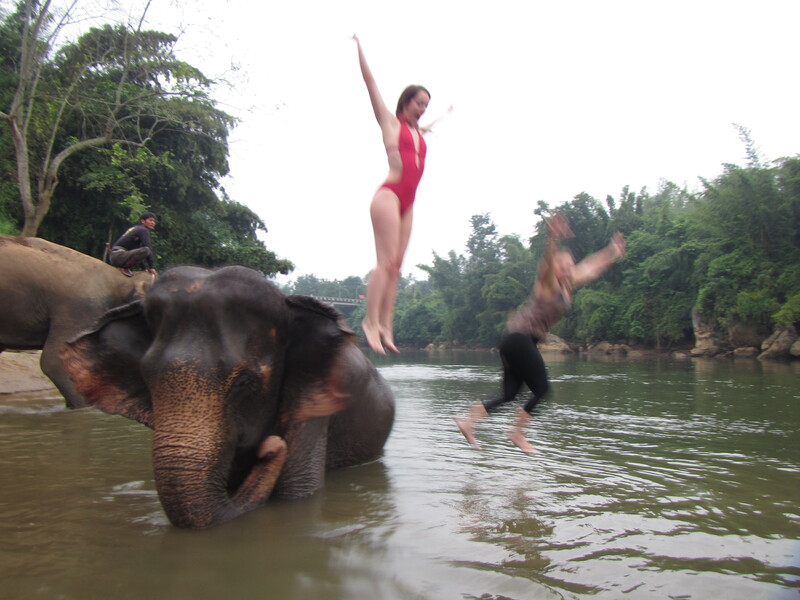 We climbed up on the elephants head and were told to hold on tight, immediately after the elephant plunged its head in the water and began shaking until we released our grip and slid off the side. All of a sudden we were playing a game that we did not know the rules to. 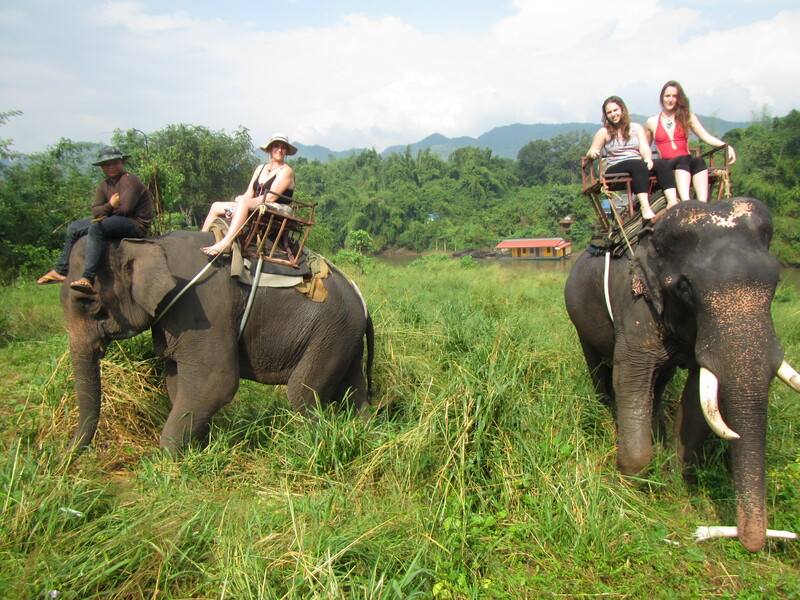 We got back on the elephant and the same thing happened. Our elephant was very excited that she was winning the game and took a real liking to us. We were able to brush the dirt off of its trunk and forehead and I was able to get eye to eye with the beautiful animal. When the bath was over, which went way too quickly the elephant carried us out of the water back to the camp and then we got to feed it a banana breakfast and had to go back to camp for our own breakfast. After breakfast we loaded in the van and had an hour ride to Erawan National Park where we spent a couple of hours hiking up the falls and swimming in the clear blue water. As soon as we put our feet in the water the fish swarmed began biting our feet and legs. These fish had much sharper teeth than the fish that nibbled on us during our fish pedicure and it was more painful than ticklish. We decided it was too much for us so we just sat on top of one of the falls where the running water was the strongest so the fish would stay away. When we hiked down to the bottom, a delicious pad thai lunch was ready for us. The last stop of the day was Tiger Temple and I was anxious the entire ride there. We had a ways to walk from the entrance before we reached the tiger sanctuary and when we did there were a dozen tigers of all different sizes and ages just waiting for me to play with them; well that’s what I told myself. 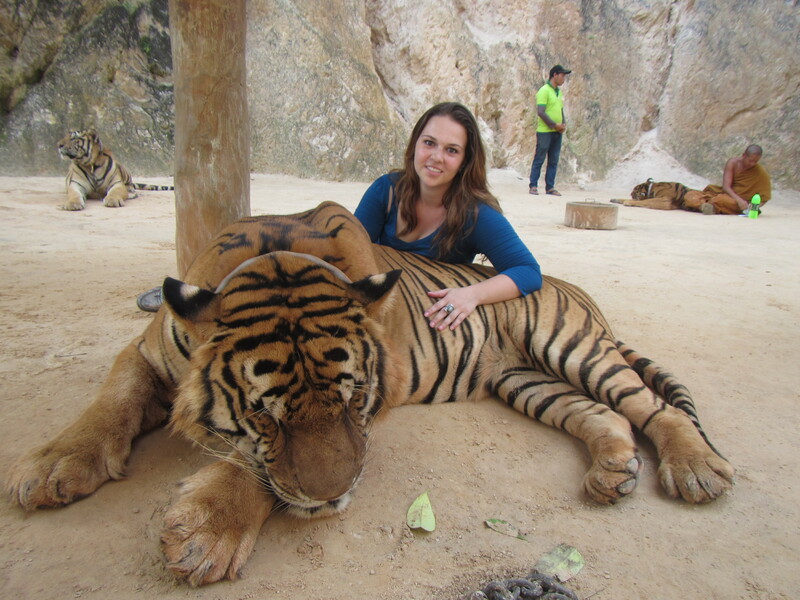 I got to watch the monk feed a tiger and play with a little baby. Finally it was time to reach the big guy and I was so excited I gave him a big hug and got an awesome picture laying on him!